As it should be clear to you what the core gameplay is (movement speed, jumping height, weapon recoils, etc), I won't put a lot of effort into that. I've listed most of the required measurements of all current games. All measurements are referred with gridpower 3 and are generally measured (not the actual limit, but a solid one). Trickjumps are ignored as the aren't part of the primary gameplay. Although the weapons which are being used throughout games matter a lot within the gameplay (thus the flow also); they won't be referred here as all games have their own documents for that. The minimal height of ceilings and doorways is 5 cubes on Sauerbraten, Red Eclipse, Tesseract and Assault Cube (4 1/2 is still tolerable also, except on Red Eclipse). 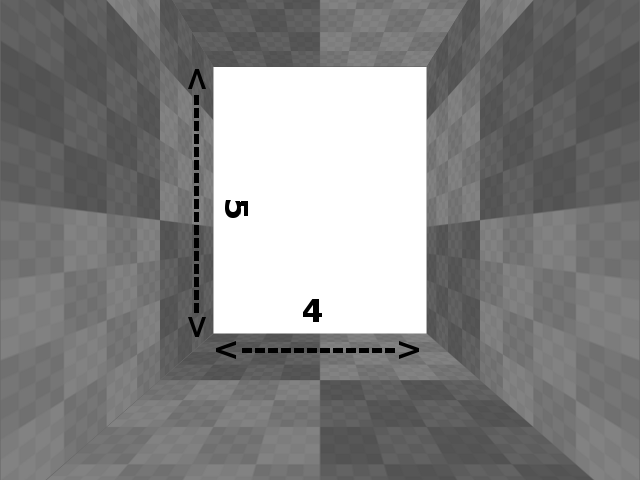 The minimal width between walls or within a doorway is 4 cubes on all games. 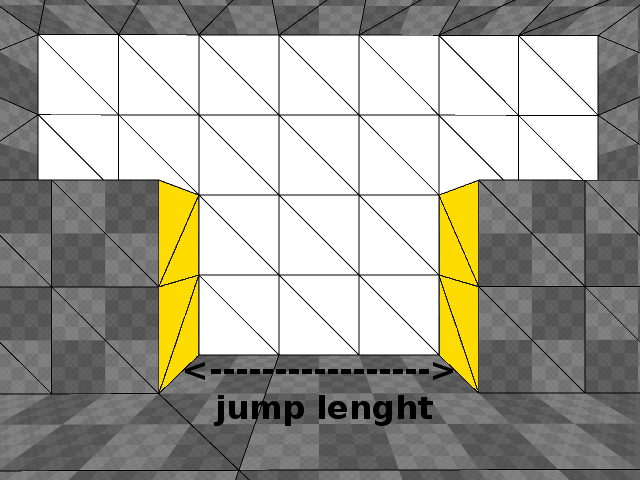 The maximal height to jump on an edge is generally 2 cubes. The best measures for stairs is 0,5:1 (so a half cube up, 1 cube long), but 0,25:0,5 works also (so a quarter cube up, a half cube long). 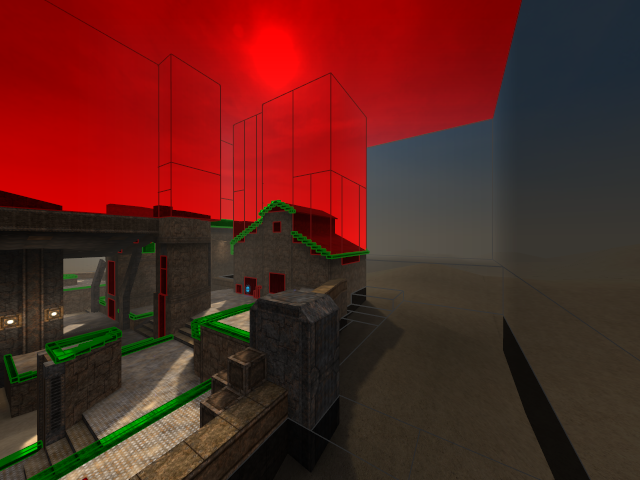 The maximal distance between 2 platforms which can be jumped (straight forward) from one to another is 12 cubes on Sauerbraten, 10 cubes on Red Eclipse, 8 cubes on Tesseract and 7 on Assault Cube (by using strafe-acceleration, else 4 1/2 cubes). 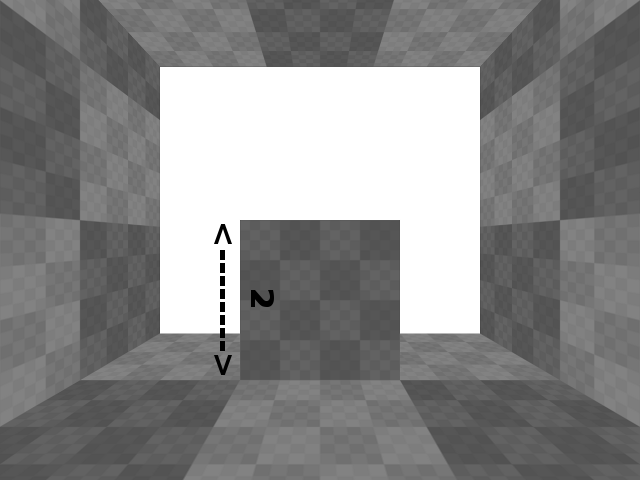 The maximal angle of a slope which can be walked on is 61,875° (a cube being pushed 5 times at front) on Sauerbraten and Red Eclipse, 56,25°(a cube being pushed 6 times at front) on Tesseract and none on Assault Cube as it is undetermined. As the flow of a map highly depends on the layout, you should keep in mind for what kind of gamemode are you actually mapping. There is no place for such a thing in maps which aim for modes on Deathmatch or Capture. However, it often is preferred on maps which are oriented on Capture The Flag (as being more competitive towards maps which are asymmetrical while their goal is Capture The Flag as well). 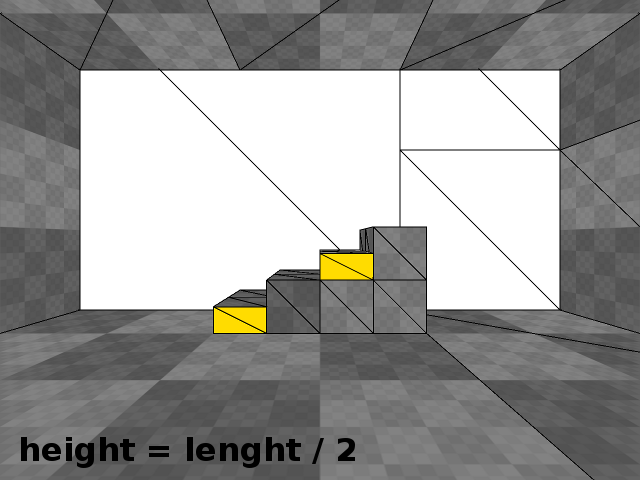 In a certain way, every type of gameplay needs some difference in height between rooms, areas or platforms. However, some gamemodes rather prefer not too much difference as it destabilizes it. For example, maps which aim rather for a simplistic gameplay like Instantgib should have less difference between platforms than maps which aim for a more complex gameplay like Free For All (as weapons like the grenadelauncher and rocketlauncher are more useful in such situation). This may not matter a lot compared to the other points, but certainly shouldn't be forgotten. 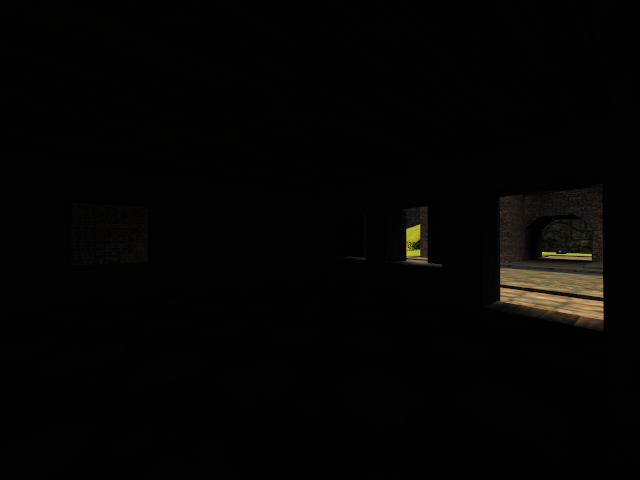 Long narrow paths (like hallways for example) never work well on any game. Keep the length of paths flexible and make sure there are enough connections to other paths. This point matters also if the gamemode is more simplistic than complex. Maps which rather aim for Instantgib should contain less things to take cover behind (so like a hole-shaped layout in Deathmatch) than maps which aim for Free For All, which often have several rooms with individual weapons spawning within them. If the difference in height is considerably big, some stairs is often not the right choice. A better option is to use a jumppad, except if the difference is that big (or there is some required geometry between the two rooms, areas or platforms), then a teleport would fit better. If the approach towards the higher platform has to be silent, only then a ladder should be chosen, else use anything other than that. The reason for this is that a ladder can only be occupied by 1 person at the time (all other players won't be able to move further until the first user left the ladder). A jumppad or teleport only take a split second to use before some other player can use it also; which doesn't slow down the flow that way. The same counts for elevators; they can only be occupied by 1 person at the time (although more people could be elevated at 1 time), so it's not very flexible to use compared to jumppads and teleports. If there's quite some difference in length between rooms, areas or platforms, a teleport is rather preferred than a jumppad. The reason for this is that teleports don't need a direct connection; you can move in the teleport from 1 side of the room, while spawning at the teledest at the opposite side of another room. However, you should take caution not to use too much teleports or jumppads, as they are directing players to a specific location, no matter if the player wants it or not. Stairs are a good choice when the length and height is about to be equal and not too much. Long stairs are often considered as bad because players are a more predictable target than on solid ground. While making a layout, realism should be chosen after the aspect of gameplay and flow. It is often forgiven that something isn't realistic yet flowing and increasing the playability, than being realistic and slowing down the flow (thus making the map less playable). This topic is often overlooked while it surely matters. When making a layout, keep in mind you're using Cube Engine (2), which means you work with cubes. They may be pushed and pulled in about 56 different positions within the selection, it only makes it harder when using a lot of variety in it. Keep shapes simple. Most of the time, a texture which has the correctly specified shader-settings is even more effective than handcrafted geometry. If you really want to use some complex geometry, try to use mapmodels instead. Never put the direction of the spawn-point towards an object which blocks a straight forward path (for example a wall, boxes or even an edge of the area or platform spawning on as it will makes the player fall down while he has not chosen to fall down in the first place). Never put the spawn-point considerably high in the air. It's fine to let players fall down for a split second like at default positioning of playerstarts; but don't let it happen intentionally. As most of the games on Cube Engine 2 (except Red Eclipse) have no features to navigate accurately mid-air, players are hopeless floating ducks which can only defend themselves by shooting. 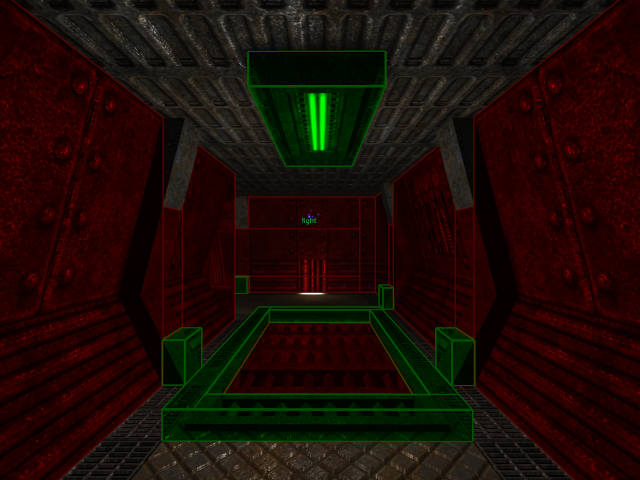 Position spawn-points some cubes away from objects (for example once more; walls, boxes or even an edge of the area or platform which the player spawns on). This gives players the opportunity to move all directions after spawning, so they have a proper chance of doing a counter attack towards their opponents. Try to place spawn-points spread over the map (even within modes like Capture The Flag! ), as it spices up the gameplay due the fact of not being predictable where the fragged player will spawn again to counter attack their opponent. On the next screenshot of ot within Sauerbraten is shown how spawn entities like playerstarts or teledests could be positioned correctly. Although it has the least effect on the flow of a map, it definitely shouldn't left unnoticed. You may want to create the most creepy place anyone has ever witnessed; be sure that paths and even corners within rooms are just enough revealed to see what's out there. However, keep in mind that the atmosphere should have enough contrast as well (in texturing, not just 1 colour; in lighting not all brighted but not all covered in darkness also). A good example on how it shouldn't be done is the next picture, which displays one of the rooms of the map within Sauerbraten; ph-capture. You can't see anything except the actual exits, but it's just a wild guess what you'll bump into while trying to reach it. This is the very last step to do when creating a layout, as it happens to be combined often while texturing or detailing and even while being in the lighting process. Nevertheless, clipping exists to avoid players getting stuck or so they won't reach undesired places. Always provide a wall of clipping material at each end of the map. This is just to be sure players won't reach the end of the map which makes them able to mess up the physics of the game and hack their selves through certain walls. Always provide a ceiling of clipping material; but high enough so the player can't reach it by regular play (also not by using trickjumps!). The ceiling of clipping just to ensure players won't reach over the clipped walls at the end of the map. Always try to fill all the space between the really end of the map and the wall of clip. The meaning of it is to increase the performance. How so? 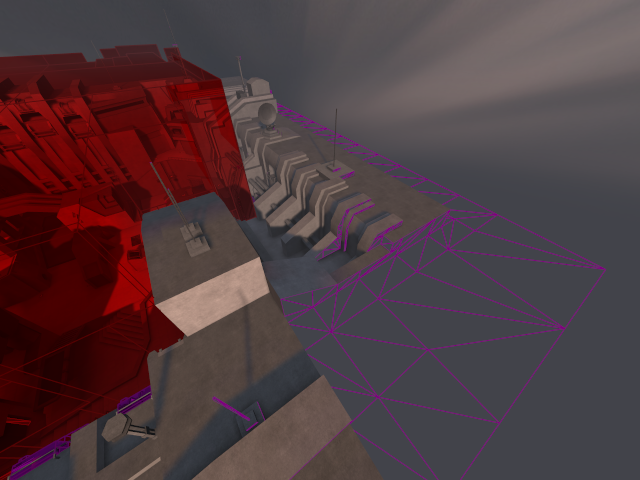 When using calclight or genpvs occlusion culling will be occurred (only on Sauerbraten and Red Eclipse). This calculates all cubes in certain views (also called viewcubes), so the map is already drawn (also called prerendered) from certain places. As cubes which contain any clipping material won't be calculated, it eventually saves file-size. Another reason to fill that particular space is to ensure no one is ever able to get through, up, under or next to the walls of clip (due mistakenly leaving a gab for example) and it also looks a lot cleaner. Clipping material may be replaced for death material, as long as fits the theme of the map and feels natural. A fence which stands under a high voltage is pretty logical to die from when trying to jump over it. Even a wall of fog may be a pretty good cause. This can be viewed in the next picture which displays the map renegade on Sauerbaten. 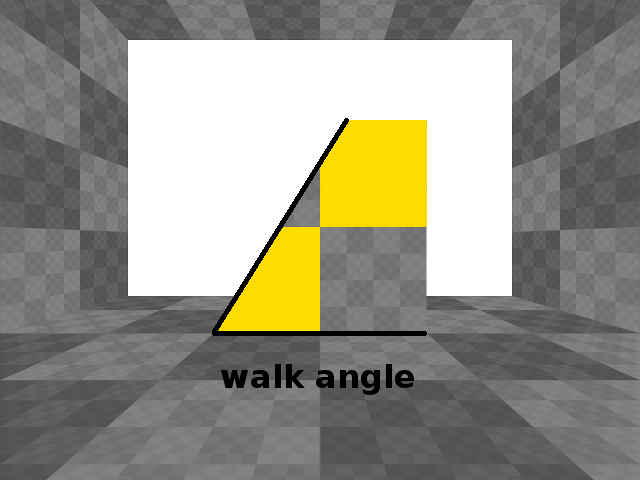 In a lot of cases, it is a good idea to use geometry which contains a sky-textured surface (by default textureslot 0). This is because that particular textureslot is also ignored when lightmaps are being calculated (it is even useful on Tesseract due the fact it will take the same rule into account). This is also to improve the playability of the map as it won't rely heavily on better hardware. All points notified above about the aspect of clipping are displayed in the next screenshot of the map collusion on Sauerbraten (except for replacing clip material for death material). Players are unable to get behind it as everything between the wall of clipping material and the actual edge of the map is fully sealed. 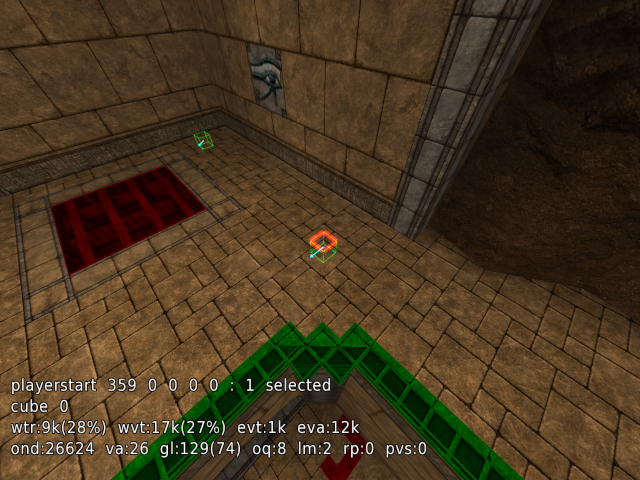 In the next picture, a good clipped corridor (as in the map metl4 on Sauerbraten) is displayed. You practically won't get stuck anywhere while moving through it. All information provided within this guide may be used as a base to create other guides, articles or as reference within comments, replies or any other conversations, as long as it's about a similar topic and the original author is credited. Original author: Suicizer. Created at: 2014-02-19 12:36:58.